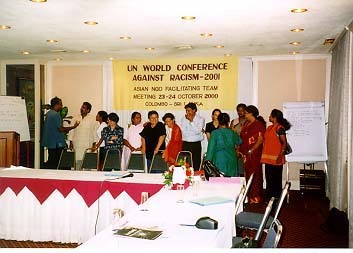 In line with the objective of bringing as many NGOs as possible into the process toward the World Conference Against Racism, Racial Discrimination, Xenophobia and Related Intolerance (WCAR), the WCAR NGO Liaison office of the UN Office of the High Commissioner for Human Rights organized a meeting of Asian (including West Asian) NGOs last October 23-24 in Colombo. In the briefing made by the NGO Liaison (Laurie Wiseberg), she discussed the problem of NGO partici-pation in the preparatory activities as well as WCAR itself. Many NGOs do not have consultative status with the UN. It is thus necessary for them to apply for accreditation. She said that her office would try to be flexible in dealing with the application by NGOs for accreditation. She explained the progress of the movement so far in both UN and NGO sectors in other regions (Europe, Americas and Africa). Although there are some differences about the issues between regions, matters such as how to organize a movement by NGOs toward the conference, criteria of NGOs that will receive financial support by UN, and ways of lobbying are commonly discussed in every region so far. Basically, the conference itself is an inter-governmental meeting in which state governments prepare and discuss a plan of action and declaration. On the other hand, an NGO Forum, which will be held parallel to the world conference, will be the place for finding out strategies for lobbying, the place to influence the governmental process. She also said that the UN expects as many young people as possible to participate in the conference. The solution to the problems will greatly depend on the youth who will constitute the core members in the fight against racism in the 21st century. Reports on other related activities in the region such as the NGO parallel meeting in Geneva at the first PrepCom meeting in May 2000, the UN Experts Seminar on migration and trafficking of children and women in September 2000 in Bangkok as well as subregional and national activities were made. The participants discussed possible strategies that the NGO movement in the region can take in preparation for the conference. They agreed that the themes to be adopted would be 1) ethnic and national minorities, 2) caste, 3) indigenous people, 4) women, 5) religious minorities and 6) migrant workers. And the issues, which will intersect all the themes, would be livelihood, violence, gender, equal opportunity, refugees/internally displaced people/asylum seekers, trafficking, land, labor and employment, globalization, self-determination, governance and armed conflict. In addition, possible resources (persons or organizations) who will prepare a report on each theme were discussed as well as the person who will compile all reports into one. It was agreed that several meetings should be held. They include a global satellite conference on each theme (the one on caste will be held in March in India), a meeting by the indigenous people in Asia, meetings at the national level, meetings of refugees/internally displaced people/asylum seekers, and public hearings. Countries in which NGOs still need to be identified are also discussed. Among them are Bangladesh, Nepal, Pakistan, China, Vietnam India (indigenous, religious minorities, migrant workers) and Bhutan. It was agreed that participants would set up their respective national coalition teams that will link up with the Asian coordinating team. They will publicize the coalition's work and gauge what the gaps are and which groups are being left out. It was agreed that every country should organize at least a national consultation, and that all draft reports should use the WCAR agenda as a framework. A regional facilitating team for WCAR was discussed as important in conveying information to grassroots groups or victims, making their access to the conference processes easy, and encouraging them to bring their voices to the conference. This body can also coordinate NGO movements in each country. A three-tiered body consisting of the general body (defined as "NGOs relating to WCAR in Asia, Pacific and Arab Asia"), the Regional Coordinating Team (with 12 members) and the Asian Facilitating Team (with two members) was adopted. Thirteen persons or NGOs were suggested as possible members of the Regional Coordinating Team. Nimalka Fernando (International Movement Against All forms of Discrimination and Racism [IMADR]) and Nizam Assaf (Arab Human Rights Association) were elected members of the Asian Facilitating Team. Three other persons were selected representing the dalit group, indigenous group and youth. Fernando (IMADR) will continue to act as secretary of the Asian Facilitating Team. Another regional meeting will be held (in addition to the thematic and national meetings previously agreed upon) to discuss further activities in the region. While the UN has already planned an NGO meeting in Amman, another meeting in another sub-region (possibly in Nepal) was suggested. The participants likewise discussed ways by which the UN fund for NGO participation can be distributed to NGOs who will participate in the parallel NGO meeting in Tehran in February 2001. The Asian Coordinating Team met for the first time after the general meeting. The team discussed the preparatory activities for the Tehran meeting.